There are a variety of different styles of lamps and lanterns that allow one to not use electricity. This post will be concentrating on those that require some sort of fuel, oil lamps and lanterns. It will also diagram the basic pieces of a lamp for clarity. It’ll burn and provide light. More modern lamps have some pieces in common that are a little more specific. The font: The part of the lamp in which fuel is stored. The collar or filling cap: This is where fuel is added. The burner: The metal piece which holds the wick and is able to pull it up as it burns. The burner adjusts the wick. The wick: A piece of cloth which draws up fuel from the font. The mantle: A slightly radioactive shell which incandesces when lit. The chimney: A glass pipe which allows for better draw on the wick, allowing it to incandesce at it’s optimal height and brightness. In modern terms, however, the idea evolved into some fairly distinct lamp types. This post will detail the differences in each. Lamps come in a variety of shapes and sizes. Most commonly, they come in a few basic variations. The hall or bedroom lamp, with an pixie burner, which gives off a single candle’s worth of light. Other small burners are called acorn or nutmeg. The lamp on the left is a hall or bedroom lamp. The one on the right, a banquet or pedestal lamp. The table lamp, with a number 2 burner, which gives off approximately 3-5 candle’s worth of light. The banquet, pedestal lamp, or student lamp typically with a number 3 burner, which gives off approximately 5-7 candles worth of light. These lamps come in a variety of styles. The center draft lamp, with it’s flame spreader, which gives off approximately 25 candles worth of light. A mantle lamp, with a hybrid burner/mantle combination, which gives off a light bulb’s worth of light. A mantle lantern, which gives off several light bulb’s worth of light. Now, besides the amount of light each gives off, what are the differences? The hallway lamp is itty. It’s meant to be a “don’t stumble as you make your way down the hall” lamp. It is the smallest of any of this type of lamp, both in size and the amount of illumination it provides. It typically has a round wick that is about ¼ of an inch in diameter. The table lamp is the most common lamp that is found. It’s the one that you can go to the hardware store or Walmart and still purchase for around $10.00. It provides decent lighting, if you don’t need to see a lot. For better vision, you’d need several of these. This type of lamp has a flat wick that is about ½ inch in width. Typically, this type of set up is also that found in most outdoor oil lanterns. A banquet lamp is a pedestal lamp, and provides the most light of the simple burner type. (flat or round wick) This type of lamp is findable at garage & estate sales and is made new, but more difficult to find. It has a flat wick that is about ¾ of an inch in width. There is some crossover between the preceding lamp and the next lamp. You may find a pedestal lamp with a large draft – this is a crossover between clear lamp types. Manufacturers experimented with styles until they found those that were the most stable and provided the most light. They also tended to use the next burner as it came off the production line, before the designed font for the lamp may have been ready in its production run. A center draft lamp is where we get off the beaten path. This type of lamp was the height of burner only technology. These lamps most commonly went under the names Rayo and B&H (Bradley and Hubbard). They have vents around the base of the font, a large burner with vents on the bottom, a flame spreader and a round wick. They are a little more mechanical than the other oil lamps. They’re also reminiscent of a donut. They have a hole for the draft directly thru the font, but it’s engineered into the design. They also provide the most light. These frequently came with a glass shade over the chimney to provide some glare protection and diffusion. A hybrid lamp. Hybrid lamps get the best of both worlds. 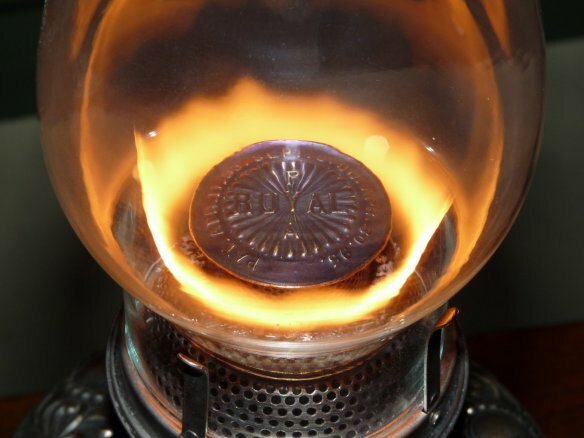 The burner, which wicks up oil to burn efficiently, and a mantle, which provides a LOT of light. 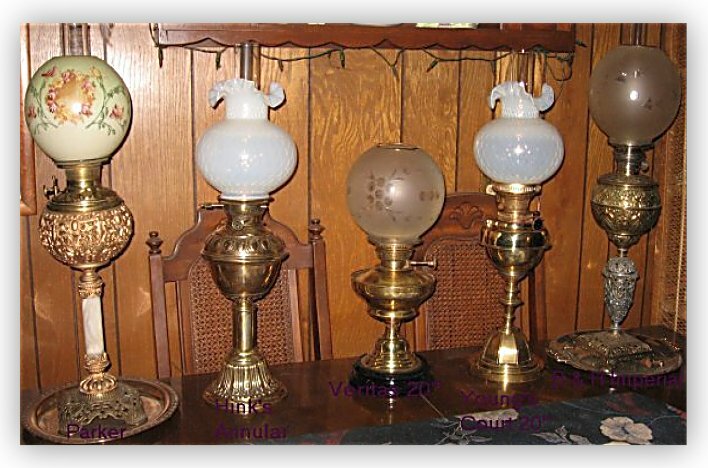 These lamps are the top of the line oil lamps, both in the past and now. The bottom of the line hybrid currently runs for around $130. A propane camping lantern. This lantern changes both fuel and how it burns. In all previous lamps and lanterns, there was a burner. This brought the fuel up from the font and allowed the lamp to burn it. With a propane lantern, the fuel is pressurized so that it feeds thru the piping under its own power. This type of lantern is the brightest of any of the different types. Mantles allow for fewer moving parts, but also have their own problems. They are a small silk and ceramic bag impregnated with metal salts. This bag may well have radioactive isotopes. The standard impregnation technique involves thorium oxide. It is what allows the light to be very bright. Standard use poses no problems to health. The mantle is attached with a string to the fuel source and lit. The silk then burns off, leaving behind a ceramic mesh. Mantles can be very delicate and fussy to use. If you have not previously used one, you may wish to do so with a ready supply of new mantles on hand, as they tend to break easily. That said, I and many others do love this type of lamp. Another excellent site for figuring out what you’ve got is www.oillampparts.com (no affiliation) Happy lamp shopping! 1 Comment on "Non-electric, fuel based lamps"
Nice technical detail of lamps and lanterns. They burn kerosene or lamp oil, and there’s a difference between the two. Kerosene, ‘K-1’, you can buy at lots of gas stations out in the boonies (don’t seem to find the pumps very often in suburban stations) and it’s relatively cheap. However, in most people’s opinion, kerosene STINKS when you burn it, thereby stinking up the house when burned in lamps. Lamp oil, on the other hand, generally smells more like an ordinary candle burning, there’s a little smell to it, but most consider it acceptable. Also, the stuff is more expensive than kerosene, because it’s refined, or filtered or whatever, that removes the odor. I have heard of people using diesel fuel in lamps, but I don’t recommend that, and it stinks even worse than kerosene.